"Shaw Memorial Hall Central Washington State College"
Located on the northeast corner of 8th Avenue and D Street, the Shaw Memorial Hall was built in 1929. The Washington State Legislature appropriated $100,000 for the construction of a large new classroom building for the college. Named after Reginald Shaw a favorite Professor of Geography from 1935 to 1952, the large, two story brick building with its six classic Greek columns is situated to the left of Barge Hall. The Shaw Memorial Hall was the college library until 1963 when a large addition was completed. The building was renamed Shaw-Smyser Hall. Selden Smyser was Professor of Social Sciences from 1916 to 1942. 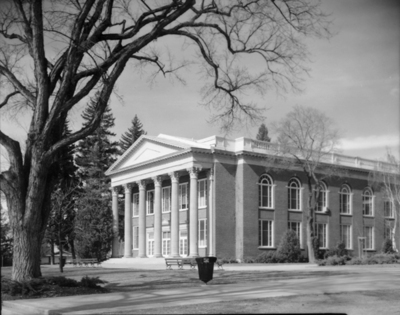 "Shaw Memorial Hall Central Washington State College" (1950). Ellensburg History Photographs. 97.